If you notice any of these signs and are in the Greater Manchester area, contact ST Heating Services Ltd. or call us 0161 279 0137 immediately. ST Heating Services are equipped to provide commercial gas services in your hour of need. If you are elsewhere in the UK or unable to reach someone, dial 999. Turn off gas supply at the gas meter. It is important to familiarise yourself with your gas meter so that you know what to do in an emergency. The valve regulating the flow of gas may be hard to locate or access, as it will be connected to the pipe at a right angle. Ensure gas appliances have been turned off, and have not been left on unlit. 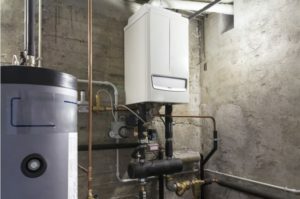 Over time, the seals connecting the piping of gas appliances can corrode, meaning that gas appliances are a possible source of a gas leak even if you have not left them turned on. Avoid using electrical switches. This includes light switches and electrical doorbells. The sparks could cause an explosion. Don’t smoke or use a naked flame, including candles, as this could ignite the gas leak. Ventilate your home, or the space where the suspected leak has occurred. Open doors and windows, to allow air to circulate and disperse the gas. Leave them open until help has arrived. Do not make a call from your mobile phone in the space where the suspected gas leak has occurred. Go outside or to a neighbour’s home if you need to make use of a mobile phone. Remember, no electrical devices should be used. ST Heating Services Ltd are able to meet your needs pertaining to repairs and maintenance for boilers and heating systems, and are Gas Safe registered to provide commercial gas services. This means they are officially registered and qualified to work safely and legally on gas appliances. ST Heating operate throughout Manchester and the North West, and are equipped to deal with major and minor issues. Whether you have a gas leak or another heating or plumbing need, don’t hesitate to contact ST Heating Services!